Underwriting conservatively is always paramount to any purchase. Buying right is always more important than selling right! That means knowing your surrounding market for the type of property you are purchasing, including the price, size, and type categories. 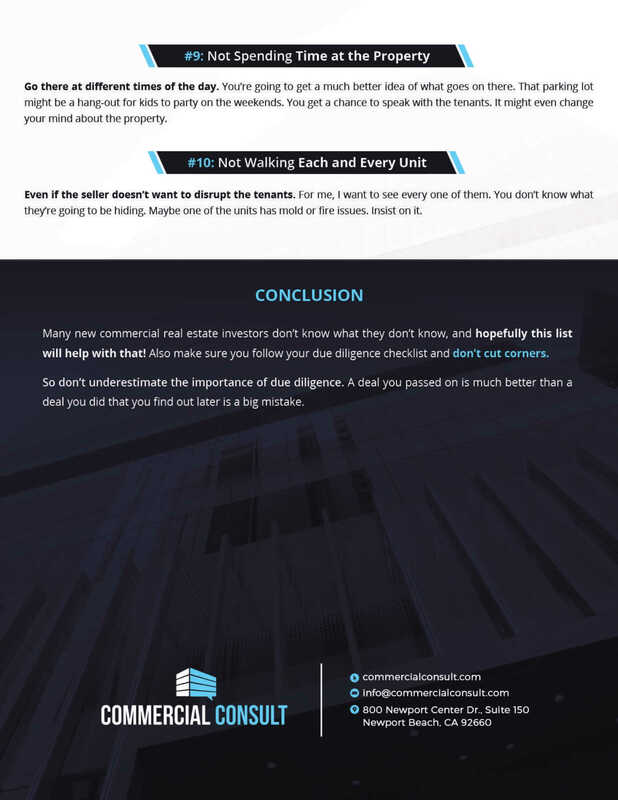 Commercial brokers in the area that deal with the purchasing property's asset type can help guide you to a better understanding of true price. During the escrow process you may find additional information to adjust your price but during this time it will be harder to adjust the price without losing the deal. 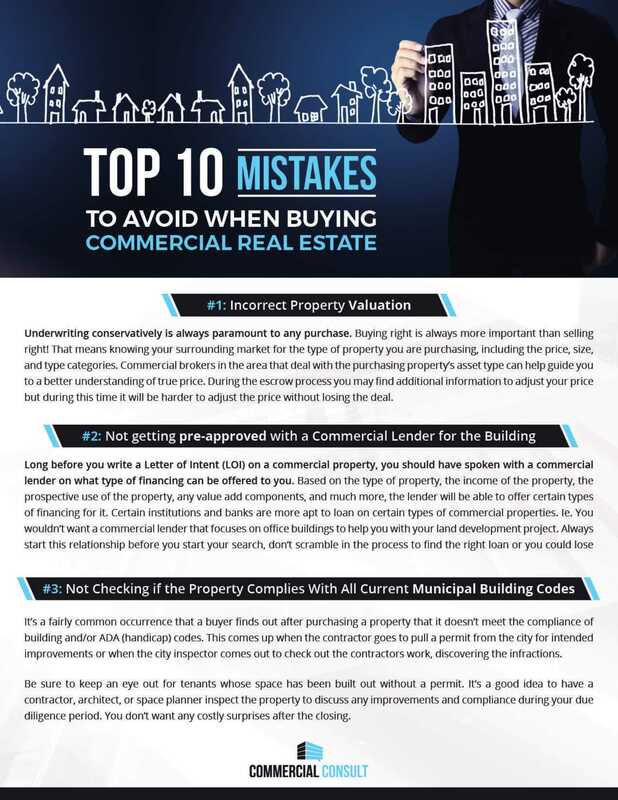 Long before you write a Letter of Intent (LOI) on a commercial property, you should have spoken with a commercial lender on what type of financing can be offered to you. Based on the type of property, the income of the property, the prospective use of the property, any value add components, and much more, the lender will be able to offer certain types of financing for it. Certain institutions and banks are more apt to loan on certain types of commercial properties. You wouldn't want a commercial lender that focuses on office buildings to help you with your land development project. Always start this relationship before you start your search, don't scramble in the process to find the right loan or you could lose the deal. It's a fairly common occurrence that a buyer finds out after purchasing a property that it doesn't meet the compliance of building and/or ADA (handicap) codes. This comes up when the contractor goes to pull a permit from the city for intended improvements or when the city inspector comes out to check out the contractors work, discovering the infractions. Be sure to keep an eye out for tenants whose space has been built out without a permit. It's a good idea to have a contractor, architect, or space planner inspect the property to discuss any improvements and compliance during your due diligence period. You don't want any costly surprises after the closing. The leases can have many "trip wires," such as cancellation provisions, contraction provisions, caps on pass-through expenses, and fixed option rents, just to name a few. You want to be aware of these provisions because if the tenant exercises them, it could put you in a bind and devalue the property. It's important to have a competent real estate attorney read the leases if you are not familiar with commercial real estate leasing. Before hiring any third-party vendors to conduct an inspection and prepare a report, make sure that your lender approves them. This goes for the Property Condition Assessment, Environmental Reports, or any specialized reports, such as seismic or geological studies. Mistakenly having to pay two different vendors for the same report costs much more than time; it is very expensive. You have to be a detective when performing your investigation/due diligence on a property you're looking to purchase. Not all sellers are going to be forthcoming when it comes to disclosing the problems of their property. Ask the hard questions and make sure you do that in writing, i.e. email them so you can keep track and record all correspondence in case you need to bring it to court one day. Always ask for backup receipts, lien releases, copies of paid invoices, etc. Remember, ASSUME NOTHING. 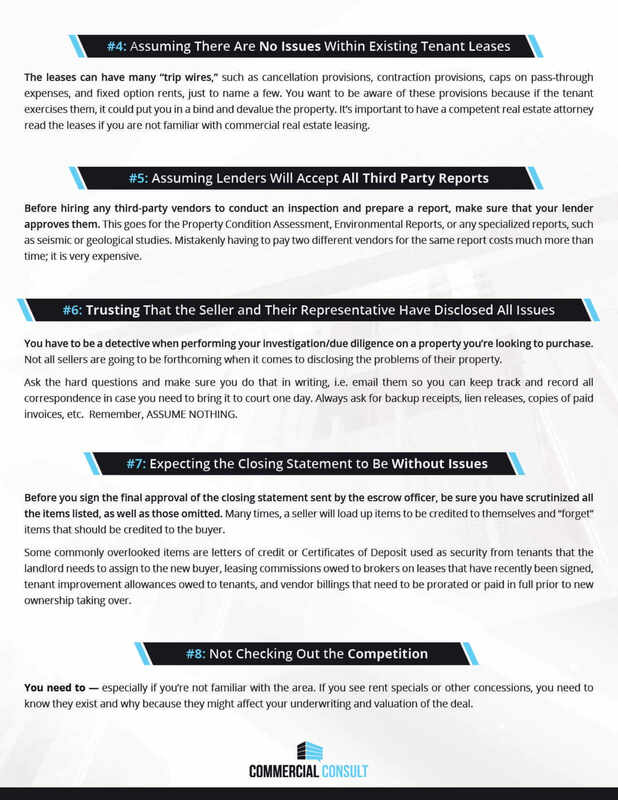 Before you sign the final approval of the closing statement sent by the escrow officer, be sure you have scrutinized all the items listed, as well as those omitted. Many times, a seller will load up items to be credited to themselves and "forget'' items that should be credited to the buyer. Some commonly overlooked items are letters of credit or Certificates of Deposit used as security from tenants that the landlord needs to assign to the new buyer, leasing commissions owed to brokers on leases that have recently been signed, tenant improvement allowances owed to tenants. and vendor billings that need to be prorated or paid in full prior to new ownership taking over. You need to - especially if you're not familiar with the area. If you see rent specials or other concessions, you need to know they exist and why because they might affect your underwriting and valuation of the deal. Go there at different times of the day. You're going to get a much better idea of what goes on there. That parking lot might be a hang-out for kids to party on the weekends. You get a chance to speak with the tenants. It might even change your mind about the property. Even if the seller doesn't want to disrupt the tenants. For me, I want to see every one of them. You don't know what they're going to be hiding. Maybe one of the units has mold or fire issues. Insist on it.